Printed silk broadside with United States President Andrew Jackson's (1767-1845) Proclamation to the People of South Carolina speech, issued on December 10, 1832. The proclamation was written by Edward Livingston, the 11th United States Secretary of State, in office May 24, 1831-May 29, 1833. 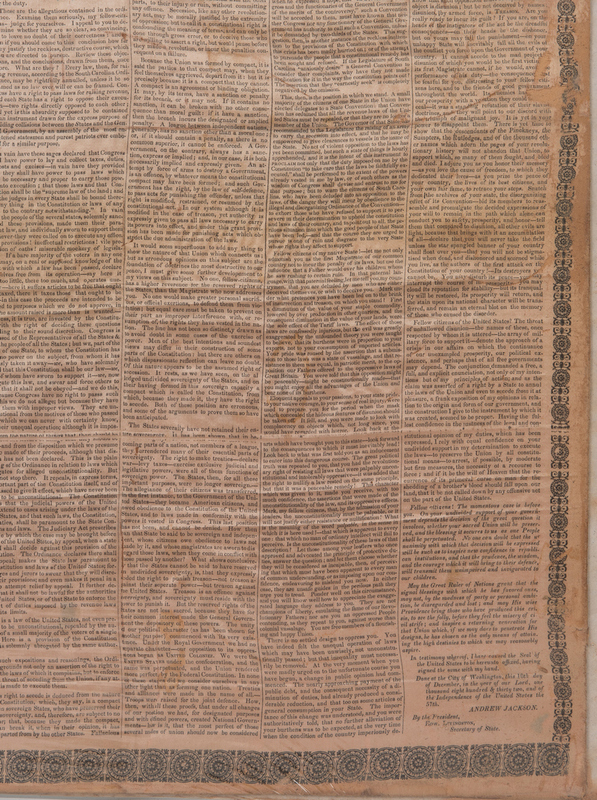 Written at the height of the Nullification Crisis, the proclamation directly responds to the Ordinance of Nullification passed by the South Carolina legislature in November 1833. Its purpose was to subdue the Nullification Crisis created by South Carolina's ordinance, and to denounce the doctrine of nullification, after South Carolina declared that the federal Tariffs of 1828 and 1832 were unconstitutional and therefore null and void within the sovereign boundaries of that state. 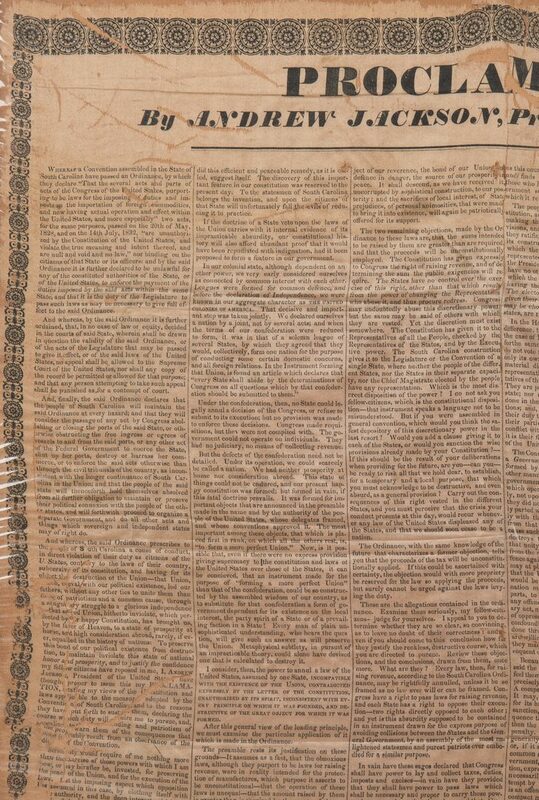 The proclamation outlines the actions taken by the South Carolina legislature and rejects the insistence on state sovereignty, focusing on the preservation of the Union as the primary issue. It declares nullification to be "incompatible with the existence of the Union, contradicted expressly by the letter of the Constitution, unauthorized by its spirit, inconsistent with every principle on which It was founded, and destructive of the great object for which it was formed". The proclamation also appeals to citizens to resist the violation of the constitution. The Nullification Crisis was one of the events that would eventually lead to the Civil War. 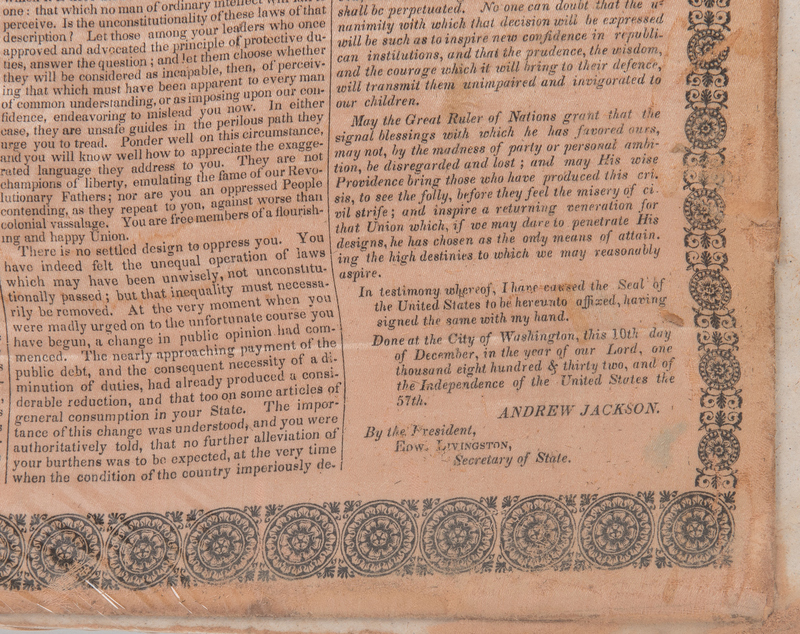 The proclamation is formatted in six columns with the title centered above, surrounded by a decorative border. 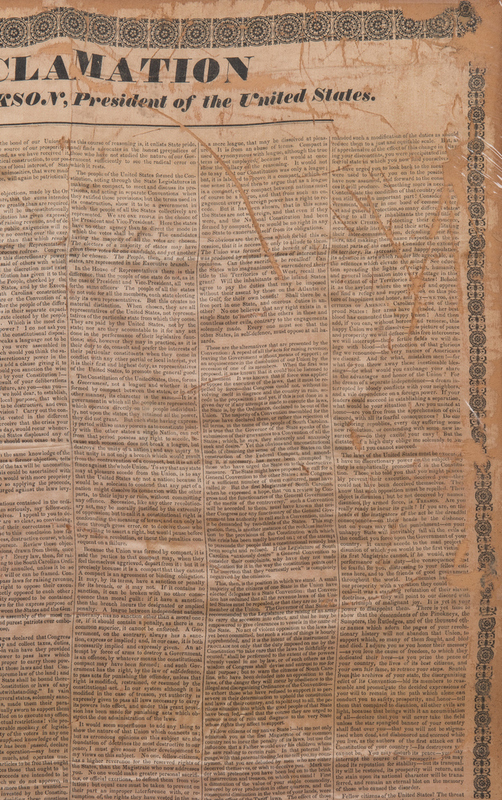 Silk laid down on old cardboard. 23 1/4" H x 16 1/4" W. Early 19th century. 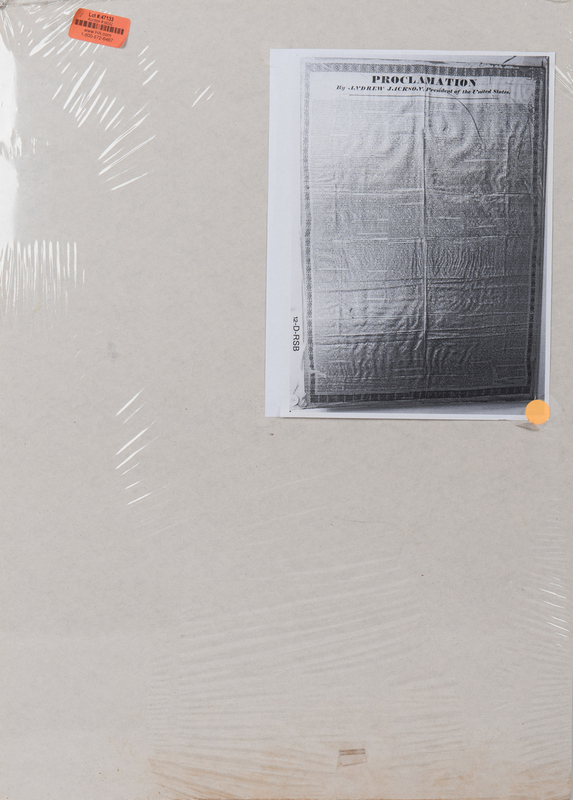 CONDITION: Broadside with fraying, stains, tears, largest 4", etc. to be expected from age. 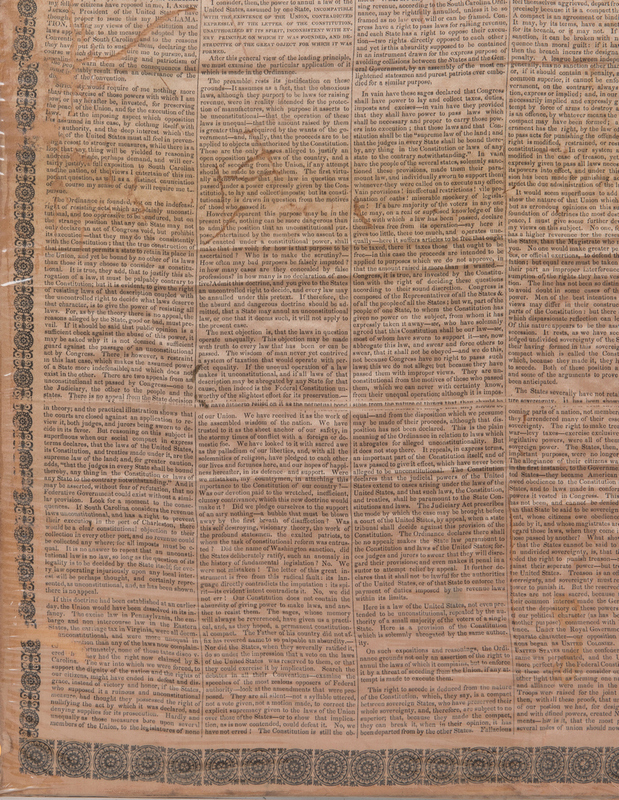 Text in legible condition. 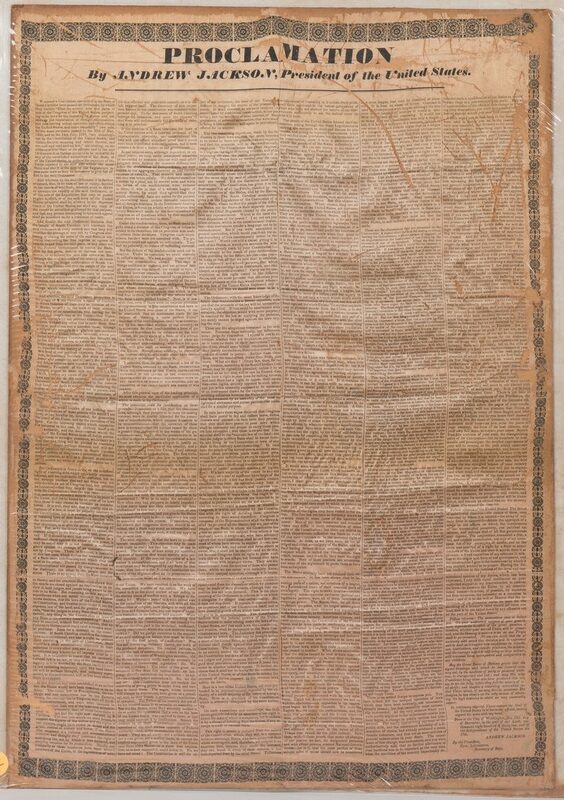 Silk laid down on old cardboard.